Preheat the oven to 325°F and grease two 8-inch nonstick cake pans with butter (the bottom and the sides). Set aside. In a large mixing bowl, combine the cake mix, eggs, pumpkin, oil and seasonings. Stir well to combine until its mostly smooth. Divide the batter evenly between the two cake pans. Smooth the tops to even out. Make for 23-26 minutes, until a cake tester inserted in the center comes out clean. Here's #6 in our Pumpkin Series this week! One more delish pumpkin recipe to go so check back tomorrow for that! You start by making Easy Peasy Pumpkin Cake -- two round 8-inch cakes, to be precise. Basically, it's a doctored white cake -- with lots of room for you to adapt the flavor to your liking. I use a little ginger and cinnamon in it, but nutmeg and cloves could work as well. Use what you like ... You can also just use pumpkin pie seasoning, if you have that in the cupboard. Next, you need frosting. For this cake, I used my Foolproof Cream Cheese Frosting. 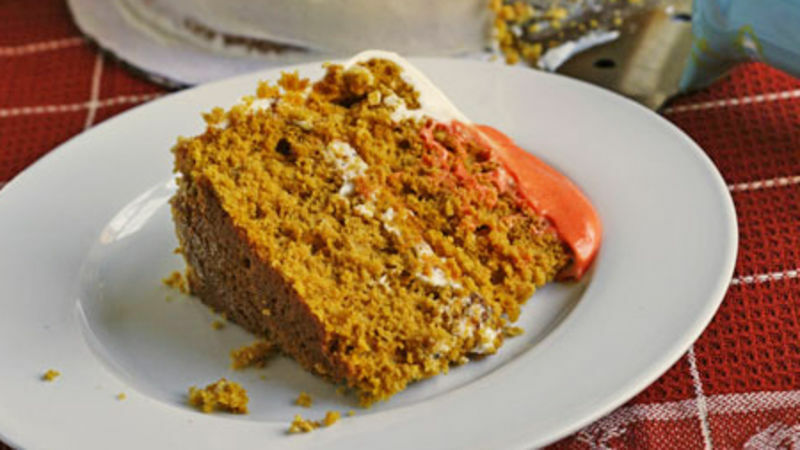 It's a great companion to the pumpkin-y cake layers. But, if you prefer, any buttercream or cream cheese frosting could work. So, now it's time to put it all together. First, level the cakes. Use a serrated knife to carefully slice the tops of the cakes off. Then, place one layer on a plate or cake round (cake rounds are cardboard circles to build cakes on -- they make for a stable base too. You can purchase them at party supply stores, craft stores and restaurant supply stores). Pipe or spoon frosting onto the cake (for the filling) and then top with the second cake. Next, use a small amount of frosting to cover the cake -- this thin first coat will prevent crumbs from reaching the surface of the frosting. Finally, do a thick layer of frosting all over the cake, and decorate as desired. Want to add a little more fun? Once the cake is frosted, dye any leftover frosting orange and use a pastry bag to pipe a pumpkin onto the top. If desired, black frosting can be used for detailing as well. Another fun idea? Transform the cake filling by mixing crushed cereal into it for a cookies-and-cream effect. Count Chocula, anyone?